The COAR Government Affairs Committee recently approved a $5,000 contribution from the association's Issues Mobilization Fund to the “yes” campaign for $40,000,000 in bonds to construct a new community recreational facility and expand programs in Redmond. The bonds, Measure 9-126, and the operating levy, Measure 9-127, will be decided by voters in the May 21, 2019 special election. The City of Madras has developed a Housing Action Plan, which includes a plan to reduce SDCs in order to help spur development. On January 30, COAR sent a letter to the Madras City Council supporting the plan. The proposal would see the City implement an SDC fee reduction for three years. After year three, SDC fees will begin to return to their original fee rates in phases (phased over three years). The ultimate sunset clause is six years. Statewide rent control has passed in Oregon, but many questions remain as landlords and property managers try to make sense of the legislation. To help clarify the impact of the law and address key areas of concern for REALTORS®, OAR has developed a summary and FAQ. The Bend City Council recently approved a package of two-year goals for the City. The 2019-21 fall into four general categories: Economic Vitality, Transportation & Infrastructure Strategies, Public Health & Safety Strategies, and Effective & Efficient City Operations. Over the past few weeks many REALTORS® have contacted OAR regarding HB 2498, a bill that could have drastic impacts on real estate brokers’ status as independent contractors. The bill was met with significant opposition in its initial hearing in the Capitol. OAR has had positive conversations with the sponsor of the legislation and it is clear the intent was not to impact REALTORS®. He has agreed to work on amendments to address REALTOR® concerns, should the bill move forward in the legislative process. 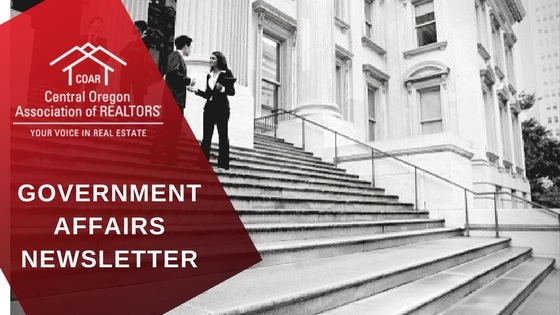 Look for more information on this bill and others during the 2019 REALTOR® Day at the Capitol on April 2.an editorial on the bill from the For Register Guard in Eugene, click the link below. On May 13th at 6:30 PM, the City of Redmond’s Urban Area Planning Commission will host a public open house to gather input on the City’s Comprehensive Plan Housing Element, as well as potential policies within a housing action plan. The potential actions in the plan range from affordable housing programs to a construction excise tax and inclusionary zoning. COAR will weigh in and members of the public are encouraged to attend and provide feedback and/or share concerns. Have an issue that you feel we should be monitoring or taking action on? Are you interested in getting involved in COAR's government affairs efforts? Contact COAR's Government Affairs Director, Tyler Neese, at tyler@coar.com or 541-382-6027.